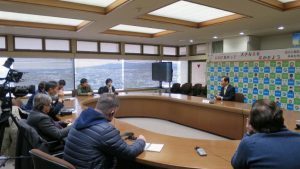 On February 14 and 15, 2019, a press tour was held to Fukuroi, which will be one of the venues for Rugby World Cup 2019 (RWC2019). This tour was sponsored by Fukuroi City and planned and operated by the FPCJ. 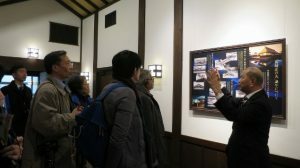 A total of ten journalists joined the tour, from media in Bangladesh, China, France, Taiwan, the UK, the US, and Vietnam, and from an English-language newspaper published in Japan. 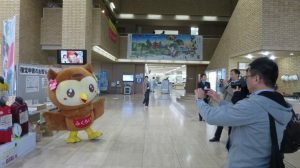 The journalists covered preparations for RWC2019, which would begin in half a year; initiatives for food education in Fukuroi; and tsunami countermeasures. ◎For more details on the stops on this press tour, please see the press tour notice here. 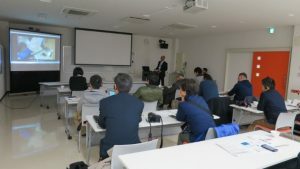 The press tour first went to Shizuoka Stadium ECOPA, which will be one of the venues for RWC2019, and listened as a Fukuroi City official gave an overview of the city, including its geography, population, and major industries. 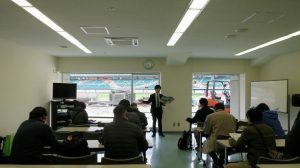 Next, the journalists heard from Ogasayama Sports Park ECOPA staff about the stadium’s preparations, before viewing the seating, locker rooms, and field. 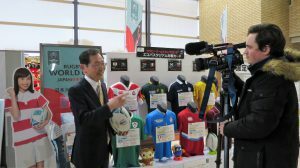 The journalists asked questions such as whether they felt any pressure hosting the top teams in the world, such as Japan’s opponent Ireland, and what access to the stadium is like. The staff member responded by introducing Japan’s success in rugby in the past, including the 2015 match in England, and stated that preparations were perfect. 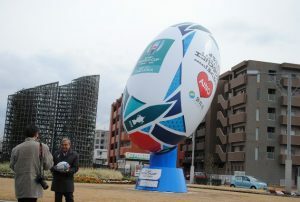 The journalists then went to the closest train station to the stadium, Aino Station, and saw its giant rugby ball monument. 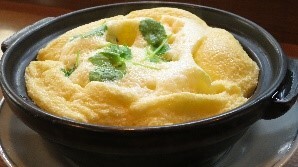 For lunch, the tour ate tamago fuwafuwa, a reproduction of a local egg dish said to have been eaten in Fukuroi in the Edo period (1603–1868). 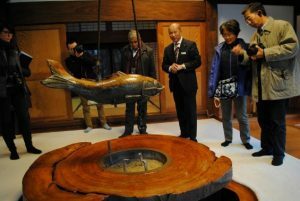 Staff from the Fukuroi City Tourism Association explained the dish’s background. An official from the city’s Risk Management Section gave a briefing on Fukuroi’s tsunami countermeasures. While showing the hazard map distributed to all citizens, the official explained the locations of evacuation facilities in the city and efforts to inform citizens. 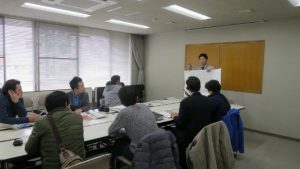 The journalists asked questions about the likelihood of a tsunami occurring in the next 30 years, how many families in the city lived within one kilometer of the ocean, and what the largest earthquake ever in Fukuroi was. 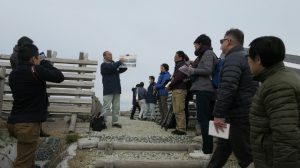 The tour visited the coast, where construction of a seawall a total of 5.35 kilometers long is being carried out, and heard from an official with the Fukuroi City Construction Division about the construction of a seawall to protect citizens’ property. 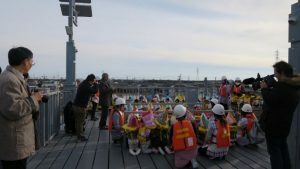 The journalists asked questions such as how much the city had invested in tsunami and earthquake countermeasures, and whether any citizens were opposed to the construction of the seawall. They also mentioned opinions that using an earthen embankment and barrier forest instead of concrete to stop tsunami was an excellent idea. One of the journalists asked the official for a message about the safety of the city to the rugby fans who would be visiting Fukuroi for RWC2019. 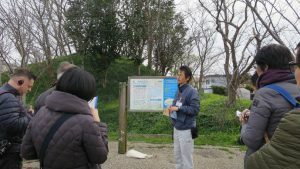 The tour visited the Nashinden Inochi-yama (“life mountain”), built in the Edo period to protect residents’ lives from tsunami, and heard about what it was like at the time from a staff member of the Fukuroi City Board of Education. The journalists asked questions including why there were no inochi-yama left from the Edo period in other regions, how far it was from the sea, and how many people the inochi-yama could fit. 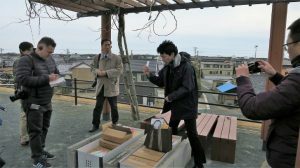 The tour visited Minato Inochi-yama, a modern-day inochi-yama built after the Great East Japan Earthquake based on the wisdom of those who came before, and heard from an official from the city’s Risk Management Section about the estimated height and arrival time for tsunami. They also saw the supplies kept there, and the journalists asked questions such as how frequently these supplies were replaced. The tour visited this tower which was completed in 2012, as part of improvements to the tsunami evacuation plans in the region, and saw an evacuation drill being carried out by the children at Asaba Preschool, located nearby. When the announcement about an earthquake was made, the preschoolers immediately hid under their desks, and within five minutes had all made it up the tower. The journalists mentioned how surprised they were at the speed of the evacuation. The teacher who led the evacuation drill mentioned that the preschool carries out a drill once a week, and the preschoolers had become noticeably faster at evacuating than they were at the beginning of the year. 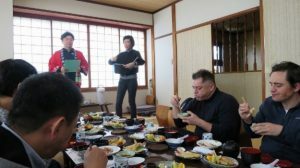 After covering tsunami evacuation measures, the tour went to Yamaha Resort Katsuragi Hotel Kitanomaru, where they were staying the night. 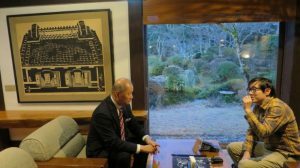 At Kitanomaru, President Ando of Yamaha Resort showed the tour the guest rooms and banquet room, and also the lounge with Yamaha’s finest audio equipment installed. The Vietnamese TV journalist then interviewed Mr. Ando personally about the beautiful wooden construction. Mr. Ando explained the background of the hotel, which was made by relocating wooden kominka (traditional houses), and spoke about its unique architectural features. The tour visited the Fukuroi Central School Lunch Center and heard from a member of the Board of Education Delicious School Lunch Division about efforts to use local produce in school lunches in Fukuroi. The journalists asked questions such as whether all the school lunches in the city were made at a central location, if the city had unique regulations such as how many vegetables to use per meal, the percentage of Western vs. Japanese meals considering the Westernization of food in Japan, and the rate of child obesity in Fukuroi compared to Japan as a whole. The journalists were also shown a video of spring rolls and hamburger patties being made at the lunch center, and commented on how impressed they were that meals were made from scratch. The tour visited a farm that produces bok choy used in school lunches, and heard about the feelings of a producer supporting school lunches with local produce. 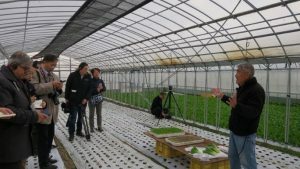 The journalists asked questions such as how long the business had been in the family, how many greenhouses he had, and what he put particular care into since his produce was being used in school lunches. The farmer explained how he worked every day to ensure he grew fresh produce. 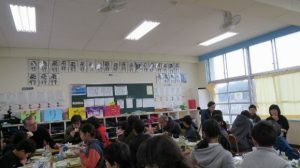 After learning how the school lunches are made and speaking with a farmer involved, the tour visited Kounan Elementary School to see how the schoolchildren actually ate lunch. 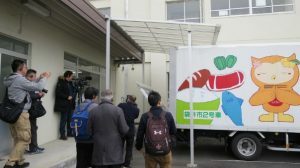 The school lunch delivery truck, with a colorful design by Fukuroi junior high school students, arrived at the elementary school, where the journalists filmed and photographed the lunches being bought to the lunch distribution room. Next, the nutrition educator explained about the job of nutrition education and how school lunches work (preparations, serving, greetings, etc. ), and gave an overview of their lessons. 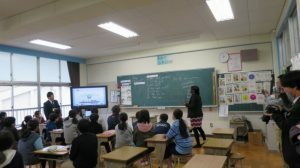 The journalists asked questions about the importance of nutritional education in elementary schools and whether the students made any requests about the menu, as well as about how many foreign students there were and whether any special considerations were given for the lunch menu, and whether seasonal Japanese events were reflected. After the fourth period class ended, the students began making preparations for lunch. The journalists covered everything from the children getting ready to serving the lunches, as well as the nutrition educator’s lesson before lunch based on the topic of mottainai (regret over wastefulness). The tour then ate lunch together with the schoolchildren. The journalists were asked questions by the students about where they were from, and what kind of work they did. After lunch, the journalists interviewed two students as representatives. In addition to asking about whether they liked the school lunches and what they were careful of when serving lunch, the journalists also asked about English classes and the Rugby World Cup. The students’ responses included mentioning they made sure everyone got the same amount when serving, and that the food was served neatly, and also that tag rugby was fun. 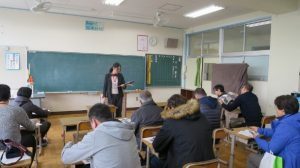 A member of the Fukuroi Board of Education explained English education and student cleaning activities, after which the tour observed an English class. The classroom was filled with the students’ energetic voices as they role-played ordering food at a restaurant. 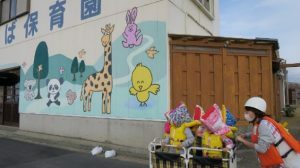 The tour then left the elementary school to go to Fukuroi City Hall. Mr. Harada spoke about efforts for the Rugby World Cup. Saying, “Increasing the number of people who like rugby is my job,” he introduced events which have been held such as tag rugby and rugby scrums. He also explained Fukuroi homestays, in which overseas visitors could stay with local families. The mayor commented on how preparations were progressing, mentioning efforts to create a system so credit cards could be used at street food vendors during the RWC. 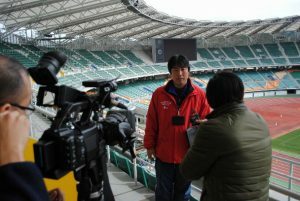 The journalists asked questions such as how Mr. Harada was applying his experience from when Fukuroi was a venue for the 2002 FIFA World Cup hosted jointly by Japan and South Korea to RWC2019, how many visitors the city expected considering it was hosting four matches with leading teams, and how much RWC2019 was expected to benefit the local economy.